Often, sellers take advantage of coupon codes, sales, etc and may buy the same MSKU at different prices even on the same day. For example, on Friday you purchased 10 widgets for $10 each. On Saturday you bought 10 more widgets for $8 each because you had a coupon. On Monday you try to put all of these widgets in the same batch, but List will only allow you to enter one cost. This is when the Sub MSKU process comes into play. While listing, just choose one of the cost/ units. Then, once the product feeds have been sent follow the process outlined below. This process also applies if you need to enter multiple cost/units for items that were not listed through InventoryLab! If you do not separate your MSKUs into Sub MSKUs, InventoryLab will use the first Cost/Unit we collected as the COGS information for accounting purposes. Navigate to the Inventory Tab and do a search for the item. When the item appears in the search results, click on the MSKU as shown below. Click on the Add Sub MSKU button. Type in the 4 required pieces of information and click the Add button. Your MSKU will then be split into Sub MSKUs as shown in this example. Each Sub MSKU will be a new Sort Sequence number. If you have no items showing in Total Remaining Quantity but want to create Sub MSKUs with the inventory already showing in a Sort Sequence, you can split it. 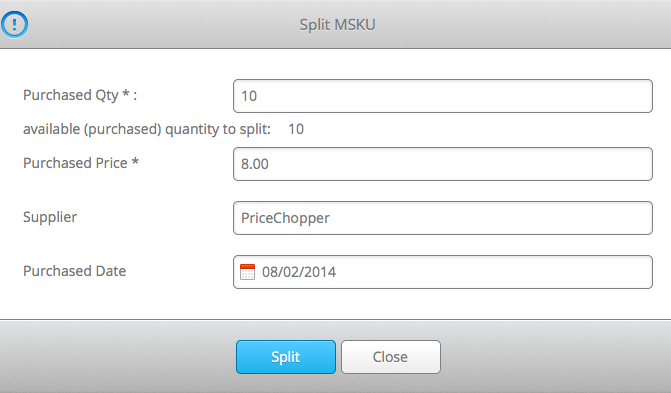 Click on the checkbox on the line you want to amend and click Split. A pop-up will appear where you can enter the information for the second purchase of 10 at $8.00 a piece. After entering the information click Split. InventoryLab now displays the correct accounting information for all 20 items.